Try something easy and special and make some of this Homemade Chocolate Liqueur. It’s love in a bottle! I’ve done a lot of liqueurs lately haven’t I? Cranberry Liqueur and Coffee Liqueur for the holidays and in my case made to give to friends and family as holiday gifts. I’ve got Limoncello in my brewing facility (OK, garage) that will be ready for summer but for right now? How about Homemade Chocolate Liqueur? I saved this one because I thought it perfect for Valentines Day and it was. Perfect. I’m fairly certain that if I presented a gift to someone from a department store they would be perplexed and confused; surely wondering if my body had been taken over by an unseen entity. Sometimes that effort can run head on into real life and buying gifts would be easier but I know it would be so much less satisfying for me and as long as the people in my life seem to enjoy the fruits of my labors, I’m keeping at it. This liqueur and the martini made with it are my offering for this day when we express our love through flowers, candy and most definitely chocolate. Forget the abundance of commercial products…make this gift for your loved ones and show them a gift straight from your heart. I don’t use Scharffen Berger for every baked good or dessert I put together; I’m also a big fan of Ghirardelli Chocolate Chips for my everyday fare. But there are times when the quality of the chocolate needs to be superior and this is my go to brand. They are only available in select stores and Whole Foods but if those options aren’t available, you can also order online. Sometimes something or someone special just deserves the very best. Make your own chocolate liqueur and then make this cocktail for someone you love! In a bowl, dissolve the cocoa powder in boiling water. In a saucepan, bring sugar and water to a simmer, stirring until sugar is dissolved. Add sugar syrup to cocoa syrup. Strain through a fine-mesh sieve into a jar with a lid. Add the vodka, cover and refrigerate for one week. To serve, stir well and strain again through a fine-mesh sieve. Fill a cocktail shaker with ice. Add the vodka and chocolate liqueur. Shake vigorously 5-6 times minimum until the container is ice cold. Strain and pour into a martini glass. Top with lightly-sweetened whipped cream. Disclaimer: This post was not sponsored by Scharffen Berger Chocolate; I just really really like their chocolate! I love this recipe! I’ve made it a few times & this last time I made it & added about 3/4 tablespoon of peppermint extract & am calling it Peppermint Patty Vodka! Really yummy!!! Thank you for the recipe! Hi there. Thanks so much for sharing your wonderful recepies…. I do have a question, is it necessary to store finished liquor in fridge? Refrigeration is not necessary, the alcohol acts as a preservative. Still…I don’t make this and hold it for long periods so I’ve never had a problem! Yay…thanks for taking the time to let me know Gordon; glad you enjoy it! It’s fun to share your own so yes, get going stat! Thanks for the recipe. I’ll be making a cocktail with this and some kirsch (the real kind not the sugary ones). I’ve been trying to work an idea for a black forest cake drink, and I think this will hit the spot. Thanks again! Let me know when you do Ray…I might have to feature that for Valentines; sound wonderful! Looks like a lovely recipe. Can you advise as to storage and shelf life? Thanks! As for shelf life it should last up to a year; or at least mine has. I keep mine in a cool place in my kitchen in winter and if your kitchen, like mine, gets warmer in the summer, putting it in the fridge might be a good idea. I make this liqueur all the time. So simple and delicious! Thank you! Thank you for the recipe to make Chocolate liqueur!! We like it our “CHOCLATINI”” made with parts: chocolate liqueur, Irish Cream, Smirnoff Vodka….poured over ice into martini glasses, and garnished with a fruit laden skewer ( ie. small pieces of pineapple, mango, papaya interspersed with Cocktail cherries ) and finally, a small Cadbury Chocolate Flake adds that last adornment!!! wonder what you will make of this one??? I just want one NOW! Sounds terrific. Have just found your site after searching for another alcoholic Liqueor called:- “Kakao mit Nuss”. A liquor from Germany I think! My Polish Mother in Law used to bring it back after going abroad on holidays & is delicious. Have not been able to find it here in Australia, or on line. This liquor when looking for translation is ‘chocolate’ with nuts’ – but is a clear, syrrupy, liquid! (I thought it tasted of almonds – but she thought is was coconuts) She also used to bring Goldwasser!. Do you have any thoughts or knowledge on this delicious drop?? I will certainly try your recipe as it sounds wonderful & great idea for gifts as you suggest. I think any brand of cocoa will work as long as it’s a good one! I love the brand I use but have also found a local brand I love too; I’ve found that using cocoa that is not Dutch processed is preferred for me; that might be my only caveat. I loved your recipe for the chocolate liquor but I also need one for white chocolate liquor. Can you help me? I LOVE this, such a great gift idea!! However, I’ve tried to make it twice now, and while the flavor is excellent, each time the chocolate settles out. I thought maybe it was because I added the vodka while it was still warm the first time, but when i repeated it, making sure to completely cool it first, it still separated. Is there some small trick I’m missing here?! Thanks!! Please keep posting liqueur recipes, I tried the cranberry one, and that one turned out fantastic!! When I made mine (I am “I already started mine:)”) I ended up letting it settle and I did not filter it for lack of time. I let it sit for about a week and a half and then I spooned out the top white residue that settles at the top. I let it sit three more days then I siphoned it from one large mason jar to another to get rid of the residue at the bottom. I did this twice with two days in between to let it settle and then ended up adding a little more vodka to make up for the loss…it was strong but so tasty! This was faster for me than filtering it and did not use up 50+ coffee filters. Make sure you put the siphoning tube ABOVE the sediment on the bottom. This does make the quantity smaller, but I also saved the bottom part and added it to hot chocolate… oh my gosh it was good. You probably don’t need to wait as long, I just wanted to let the flavors blend (I added a split vanilla bean for fun). I’ve never bothered to filter mine but siphoning is a great idea. So glad you enjoyed it! I’ve only made it with Scharffen Berger chocolate Liz so I have to wonder if you’re using a different brand an if that might be an issue? Was reading comments trying to figure out why a week of aging was called for here. I did not find one but I **THINK** I have an answer. Should also make the filtering unnecessary as well. I have not tried this yet but plan on trying it out soon. The science behind this is sound so I have confidence this will work. I noticed someone commented about sediment at the bottom and a layer of “white stuff” the “white stuff” is cocoa butter. It is forming on top because it has come out of emulsion due to the water in the recipe. So an emulsifying agent will fix this separating issue. (also reduce or eliminate the sediment forming at the bottom as well). I suggest using lethicin. It’s all natural its cheep and commonly available at health food stores in granular or liquid form. For a beverage like consistency I would use 1 teaspoon granules – 1/2 teaspoon liquid lethicin (OR LESS) per cup of the liquor. Here you have roughly 3 cups. Before adding the vodka or everclear to your chocolate and syrup mixture allow to cool to warm not hot. Pour into a blender. Mixing on med add the lethicin mix for a couple min and pour the vodka into the running blender. All you have to do then will be to allow the air to settle out and maybe skim off a little foam from the top. Filtering should not be necessary. Actually the aging is more to allow the vodka to mellow a bit and meld with the flavors. I remember that comment from a reader but I’ve never had that issue; still I appreciate your info…hopefully will help someone else down the road. I have already started making mine (3 days strong) and I was wondering if I can add lethicin any time during the process? Also, would I use the liquid or granular form? I noticed it’s hard to get rid of the layer at the top even with shaking it…any suggestions? I’m giving some of this away as gifts! I’ve not had a problem like yours and that was a reader who left those comments about using lethicin so I hesitate to instruct on something I’ve not used. Maybe you could check the link to her site and visit her for more information? I wish I could help more but I’m sort of in the middle of what may be someone’s expertise but I simply can’t concur since I’ve not had the same experience. Can you try that? A friend enjoyed some small bottles of Riunite last year, and then gave me the bottles to “recycle”…a gentle hint that she wants to be a taste tester…uh, um, I mean quality assurance team…yeah, that’s it. LOL 😉 Now to decide which liqueur to make this year. You have posted so many options to choose! I made a Chocolate Martini with a Pampered chef recipe…yummy but the G liquor was expensive… so I want to make it! It’s easy and less expensive for sure but be sure to use good cocoa. I found some great cocoa at Savory Spice Shop. Their natural cocoa product (not Dutch processed) tastes very much like the Scharffenberger and is much less expensive. May I ask why not Dutch processed? I tried this a couple days ago. It’s delicious! Even my husband and son-in-law, who tried it to be polite, were blown away by the rich smooth flavor. I confess I made a few adjustments to suit my own preferences. I added about a tablespoon of instant espresso powder to the cocoa. I substituted half granulated sugar and half brown sugar. And I put in about a 1″ piece of vanilla bean with the seeds. Only thing is that the cocoa is separating out in the bottom of the bottle and at the top there’s a white-ish solid collecting. I can’t imagine what that could be. I can agitate it to re-integrate the cocoa and I can pour through a strainer to eliminate the white particulate but it would be more satisfying to eliminate the whole business. I know I can also filter through coffee filter paper but I’m afraid I’d lose the cocoa and, in the process, the rich chocolate flavor. Any thoughts? Thanks in advance for your recipe and your recommendations. This looks wonderful! Do you know how long this will hold in the fridge if I don’t use it all at once? Quite a long time…I don’t even put mine in the fridge; the alcohol acts to preserve it. In the winter, I do have a shelf in the garage to open up shelf space in my fridge and I’ve had it for 6-8 weeks without an issue. I love this! A no-mess, 2-minute, things-I-have-in-my-pantry recipe. 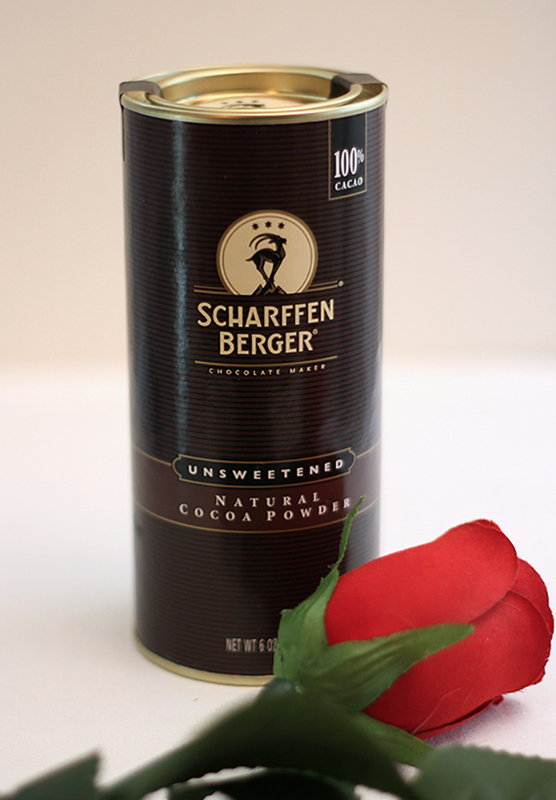 Plus it’s sweet and special and I have been dieing to use some of my Scharffen Berger cocoa in something. I know, right? So dang easy…but then once I started making liqueurs I’m amazed at just how easy most all of them are. I’m going to have to build a new bar! i will take two of these please . . . and can i just say, wow??! You can, of course! I have to find a way to engineer this into my local food bloggers group event I’m holding here in two weeks. Coffee maybe? How many times do you Wow.. I think I lost the count! You are the Czarina of creativity!! Love ya !! Looks delish Barb!! I need to make this. Right away. Very easy to make and even easier to drink. Yum! I love the chocolate liqueur… Definitely making this one for gifts. And, of course, the martini sounds just perfect! If I had more place to store it, I could go even more nuts with the liqueurs…so easy and so good. Hope you make it and let me know what you think Jen. This sounds so delicious, I am boiling the water to make a batch as I type. One question, though. How long will this liqueur keep and does it need to be refrigerated once it has steeped for that first week? Thanks so much for the inspiration. I love the idea of all of your handmade gifts….truly from the heart. When I receive a handmade gift, I always appreciate the effort so much. You’re one thoughtful lady, Barb. As for the cocktail…well, it seems like the perfect thing for an evening snuggled up by the fire. Well, that is sure the way I hope they feel. I had someone once say, ‘I need to make some handmade gifts like you do this year cause I’m broke.’ OY…the effort is lost on that person. I think handmade is richer by far (and putting Scharffen Berger into liqueur hardly qualifies for cost cutting!). Now that’s my idea of the perfect Valentine’s cocktail. Oh, yes! This is incredibly creative, Barb! I love browsing all of your homemade gift idea they are so much more special than I box of chocolates! Your cocktails are the awesomest, Barb! Rock on! I love that word…so thanks very much Carolyn! Barbara, you are so creative! I love hearing about all the incredible gifts you have given over the years. Just amazing. This chocolate liqueur looks very special indeed. Thank you Katherine; it’s sort of what I have to do. I also garden and have decorated my home; including building a bar (I should showcase that in one of my booze posts huh?). Thanks for stopping by! Oh wow, an adult iced chocolate drink – complete with creamy topping. I can see that going straight to my hips in such a happy way. You must have such fun experimenting with all these lovely drinkies, Barb! Now that’s my kind of cocktail! I can’t resist anything where chocolate is involved. Thank you for reading all the way to the end. Without a doubt a bit of tongue in cheek disclaimer. 🙂 I think dangerous is the right word. Wait, so is delicious! Thanks for stopping by Terra! Gifts from the heart are the most meaningful. These photos are so stunning! Thank you Maris and you are so right. My daughter bought me a very old cookbook from a local thrift shop; almost made me cry. She thought I was nuts but that $8 was not the point. Her knowing me well enough to find me something I will treasure was everything. I would love to take a look into your liquor cabinet. It must be a thing of beauty. Happy early Valentine’s Day to you. I liked seeing the roses in your photos. I have too much of this stuff right now; nudge me when you’re here and I might find a jar for you to take home if you’re lucky. Yes jar…those adorable bottles are pricey…I’ve now relegated my cache to Ball jars! Photography wise, this delicious martini would stand excellently on its own. Adding the rose and the bottle of chocolate liqueur in the background simply made it a stellar work of photographic art. What a lovely drink for a very special occasion. I’m looking forward to seeing that dessert you made with the liqueur as well. You let out more information about yourself in this post. I did not know that you did needlepoint, macrame and that you sew and quilt! Love it. Well, I used to do a lot of that stuff…I seem to go through periods of enjoying something but I don’t do all those things at one time! I used to make all of my own clothes too but haven’t done that for years! I just feel drawn to creative outlets; I guess photography is it right now? What a lovely way to toast someone special and a great gift idea. I am going to order some Scharffen Berger. I have never heard of it, but then we don’t have a Whole Foods where I live. YUM is all I can say.. I never realized you could make your own liquors.. That would be a fantastic skill to learn before next Christmas. Very easy Chrissy, most are just a combination of a simple syrup, flavoring and vodka. Planning ahead is key…you want the flavors to meld thoroughly and the vodka to smooth out so start 3-4 weeks ahead of when you want the end result for most liquors. You can always try them sooner…you’ll soon find what time works best for your taste. Oh my gosh I am buying vodka tomorrow! This looks SO good! Any kind of vodka? Jayne I usually ask the liquor store for a recommendation. Unlike some, I do NOT recommend Everclear, way too potent and way too harsh for my tastes. But it’s also not necessary to buy good sipping vodka since you’ll be mixing it with other components. I usually pay between $11 and $15 for a 750 ML bottle and find that the vodka in that price point works fine. Ok… ok… you’ve convinced me. This looks pretty darn good! It definitely a dessert drink…with a bite from the vodka. Not something for each and every day but a special occasion? Absolutely! Oh my goodness… that’s not only a cocktail, it’s dessert! Just realized I am out of Scharrfen Berger chocolate… I know, I know, how COULD that happen???? But now I have a terrific excuse to go and splurge – can’t wait to see what the check out guy thinks of my cart when I go to Gelson’s today – chocolate, sparkling water and coffee!! That’s absolutely what it is. Yes a bit decadent but every once in a while I’m OK with that. 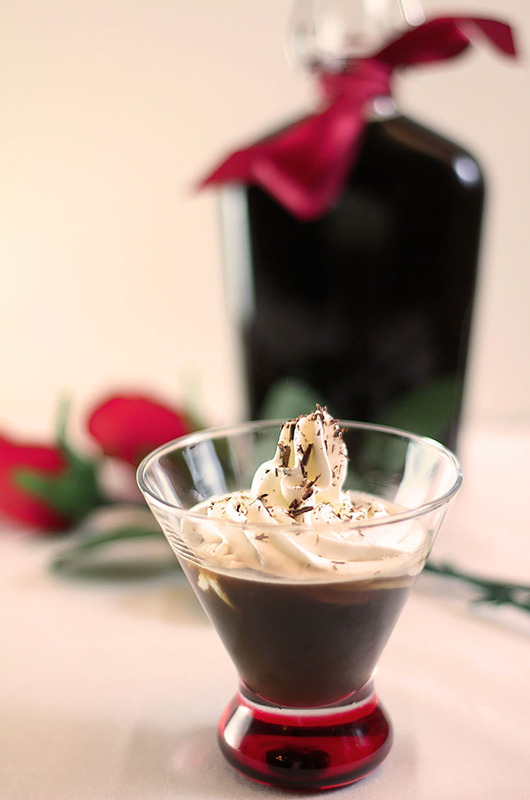 Also used the chocolate liqueur for a dessert coming out this week. With caramel. Thankful I had a houseful of people to help me finish that off! Beautiful photos Barb. What a special treat for Valentine’s Day or a day when you are snowed in by a blizzard. Hope your are keeping warm. In fact I am feeling a bit chilly…socks might be in order. But just had boy down the street call to ask if he could borrow my snowblower. In exchange for clearing my driveway and sidewalk. Um. YES!! 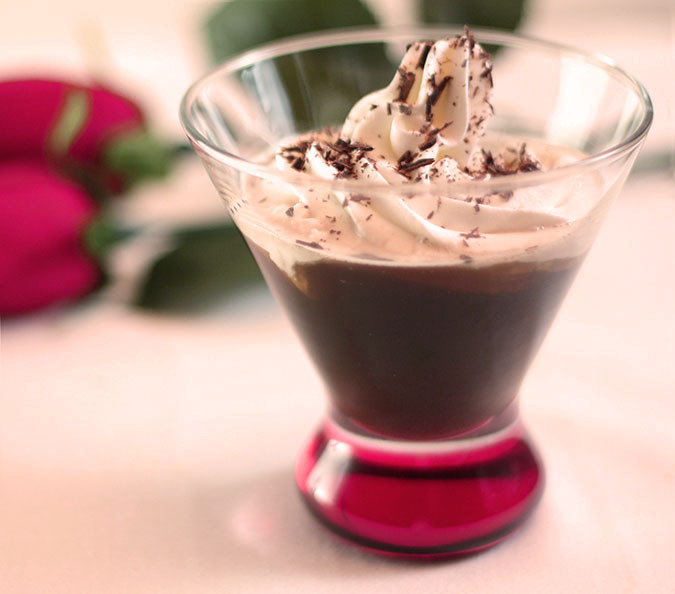 ooh now doesn’t this look good – we got some lovely chocolate liqueur over the holidays, may have to make a drink for my husband for valentine’s day – or just save this recipe for myself for after baby! As long as you have chocolate liqueur it works. I have some milk chocolate Godiva I still love. Ahem…Maple Bourbon Bacon you gave EVERYONE for Christmas? Hmmm mine must have gotten lost in the mail!